Short term technicals says that stock can move atleast 10% from present level if it hold above 176.
extend upto 205-210 in one or two weeks. 1. Security within the context of an uptrend traces an orderly price decline from a swing high much like a pullback buy. The price then rallies up to the prior swing high and stalls. A second pullback occurs as overhead resistance is decreased and the stock then forms a higher swing low. This occurs over and over again until a series of equal swing highs and higher swing lows is formed. 2. The power of an ascending triangle can be greater after a powerful upside move due to the possible increase of underlying support. 3. 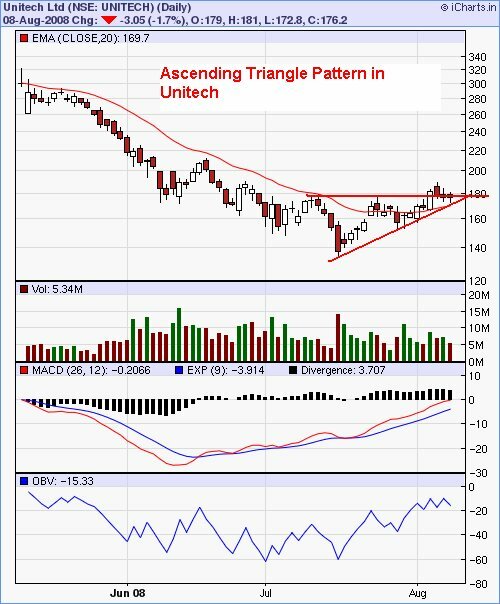 Ascending triangles can be stronger when the swing high that begins the pattern is also an all time high due to the possible lack of overhead resistance.